6th Annual Dakota's Dream Campaign! The Dakota's Dream Fundraiser has been organized by the friends and family of Dakota Bihn to raise money and awareness to combat Tay-Sachs disease. The Bihn family in concert with many other Tay-Sachs families founded the tax exempt, 501(c)(3) approved Cure Tay-Sachs Foundation in June 2007 to fund research that shows promise to treat or cure Tay-Sachs disease. Tay-Sachs disease currently has no treatment, no cure, and is fatal in children. The first five years of the Dakota's Dream Campaign raised $117,754!!! Dakota is an 13-year old from Olmsted Falls, Ohio that is battling this hereditary, degenerative neurological disease. Dakota underwent a cord blood transplant at Duke Medical Center in January of 2006, but the disease continues to progress. She is slowly losing her mental and physical capabilities because her body is missing a vital enzyme needed to clear waste from brain cells. One in every 250 people carries this fatal gene mutation that is passed on to a child when two carrier parents pass the gene to their baby. The carrier rates increase to 1 in 27 in the Ashkenazi Jewish, Louisiana Cajun, and French Canadian populations. The Irish American population finds 1 in every 50 people to be carriers of the Tay-Sachs gene. 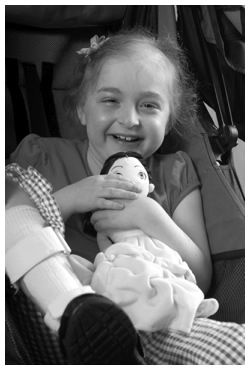 Dakota and her parents have teamed up with the Tay-Sachs Gene Therapy Consortium to battle this horrible disease. The international consortium of doctors from five highly respected research institutions (Auburn University, Boston College, Cambridge University in the UK, Harvard Medical School and the University of Massachusetts) have been developing a therapy that has proven to be highly effective in animal models. The goal is to take that research from the laboratory to the bedside for clinical trials by October 2012. If successful, this therapy may have significant impact on the nearly 44 million people in the United States alone that suffer from degenerative neurological conditions. As we move toward clinical trials - we have specific tasks that need "private" funding to move forward including vector manufacturing, sheep studies, primate studies and toxicity studies - we need $1.3 million!! We covered nearly $1 million in these pending expenses - we are making real and significant progress - we need to raise $300,000 more as soon as possible. The United States House and Senate have unanimously voted to declared September as National Tay-Sachs Awareness Month (To see the official designation click here). We need to get posters in the windows of 500 store fronts. We need local business to get involved - donations of money or raffle prizes for the after party. We want 500 kids going door to door on Saturday, September 17 between 11am and 3pm. We need host families to serve as starting points for group of kids to canvas neighborhoods (West and East side). We need people to drive groups of children to areas not covered to canvas those neighborhoods. We hope to collect over $30,000 for Tay-Sachs research. The After Party will include free t-shirts for participants, raffle prizes, food, entertainment, and Dakota. Please consider signing up to help. To sign up send an email to jbihn@sbcglobal.net. Please send the names and ages of your children, your address and phone number, the email address we can reach you at, and IF you need collection jug(s). We need your help!! Every dollar raised will be used to fund the CURE for Tay-Sachs disease. The CURE is within reach – we need your help to save Dakota and all the kids' worldwide suffering from this brutal disease.